Ever Banega was drafted into Argentina’s starting XI following their defeat to Croatia and Arsenal fans have been waxing lyrical about the midfielder’s performance. Arsenal have been linked with the Sevilla man and have reportedly held positive talks over the transfer last week after a meeting between the club and the player’s agent, according to Gazzetta dello Sport journalist Nicolo Schira. 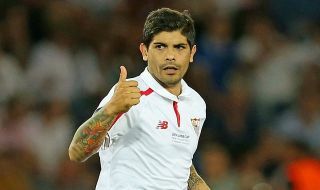 Banega played under new Arsenal boss Unai Emery at Sevilla and seems ideal to provide the Premier League club with an upgrade in the middle of the park for next season given the departure of Jack Wilshere. With creativity on the ball and discipline, Banega seems the perfect fit to add some steal in the midfield that has often been accused of being soft. He would be a useful acquisition to Arsenal and could tighten up their midfield next season – given they conceded 51 times last season in the Premier League and made 15 errors leading to a goal, according to the official Premier League website. Arsenal fans certainly would like him to be the latest signing at the Emirates, judging by his performance against Nigeria and a brilliant assist for Lionel Messi’s goal. We need that man Banega at Arsenal. He’s a midfield general. MAKE IT HAPPEN!